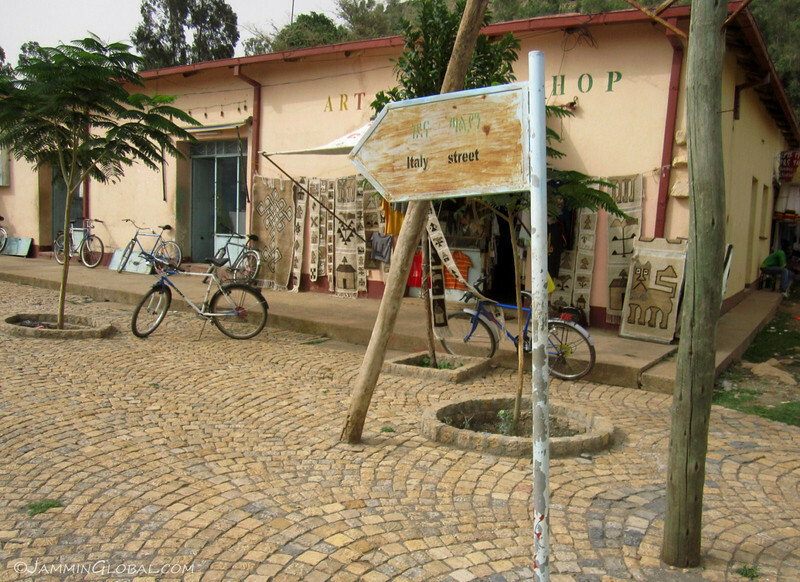 My ride north through the highlands of Ethiopia lead me to the historical city of Axum. 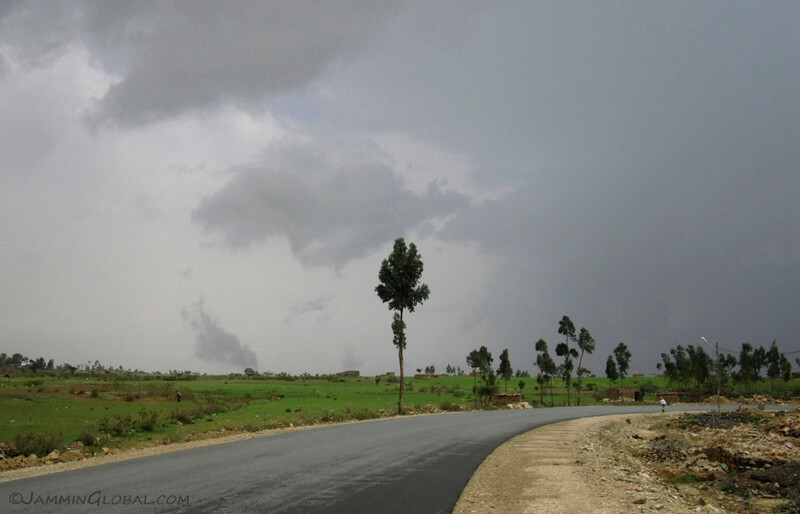 It was here that the Kingdom of Axum flourished from 100 to 940 CE, as they were aware of their strategic location in the trade route between the Roman Empire and India. Axum’s glory days were built on the fact that they had access to African products (ivory, gold, salt) that could be transported via waterways, namely the Red Sea just north of here through Eritrea and the Nile River. 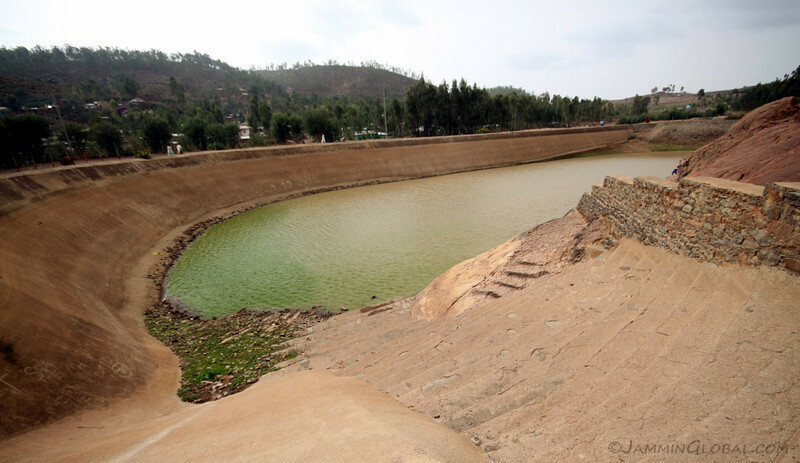 Axum is a small, remote, inland city these days, faded from its past glory, but water and riches featured prominently during its golden years. 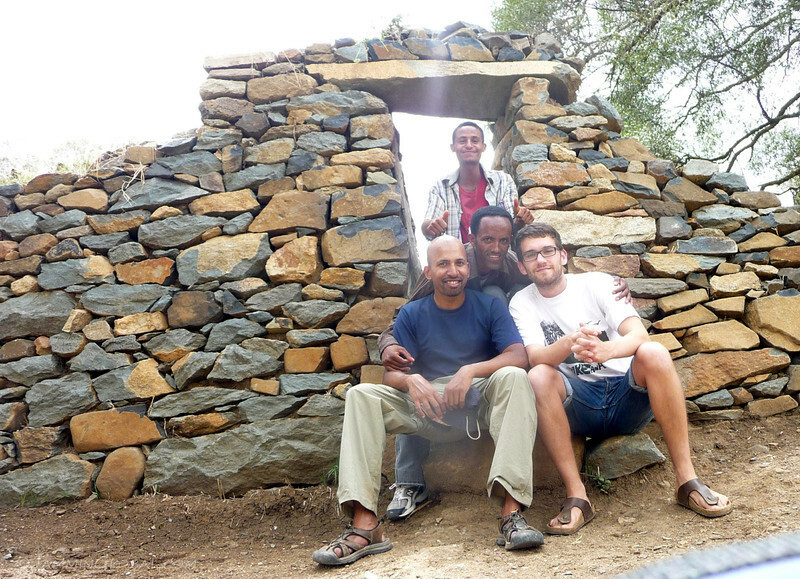 I met up with Mitch, who I met in Gondar, and together we explored some of the ancient sites in and around Axum. 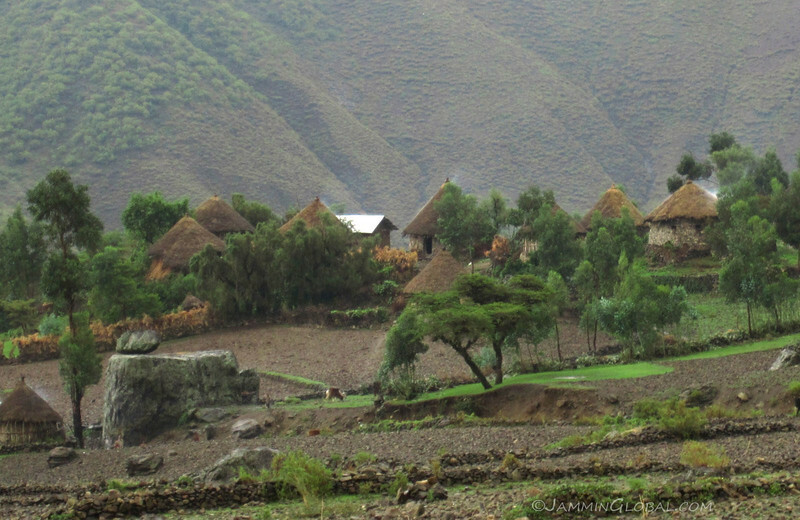 After two days there, I turned south and headed down the eastern side of the Ethiopian Highlands towards Lalibela. Entrance to the historical city of Axum, in the far north of Ethiopia, once the capital of a great kingdom but today faded to a regional city. 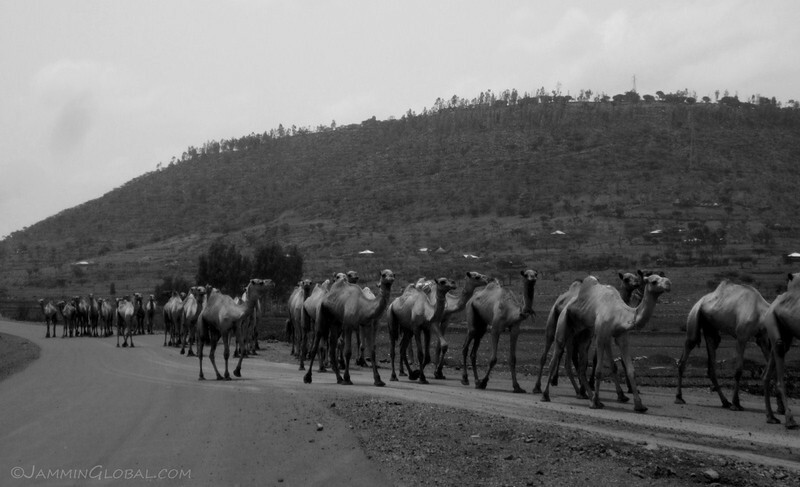 But camel caravans still cross the streets in Axum, just as they did during the millennia-long rule of this kingdom. I met up with Mitch and we went on a hike with some local friends he made up this hill outside Axum. 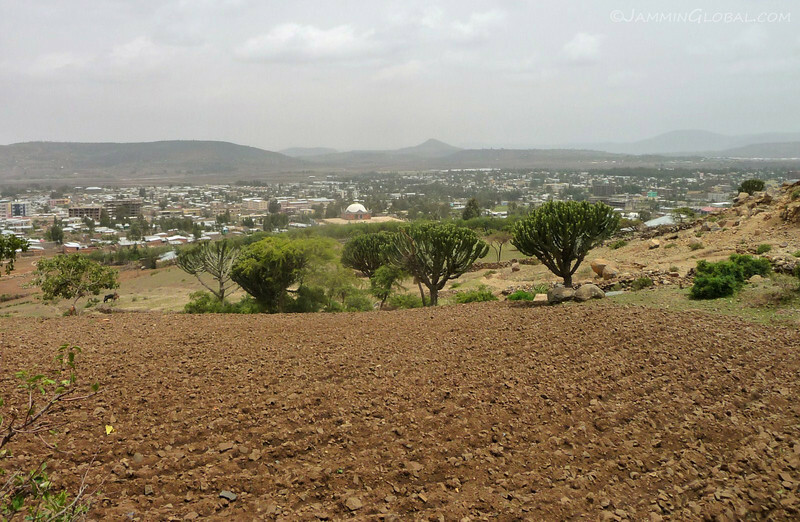 In the foreground are the rocky fields that teff is grown on with the modern city of Axum down below. The hike lead to this monastery perched on top of the hill. From here south is old-hard-to-reach-monastery land in Ethiopia, an area dotted with similar sites, a testament to the strong Christian tradition here. In the 4th century CE (AD), King Ezana II introduced Christianity to his kingdom after being converted and baptized by Saint Frumentius, who was made a bishop by the Coptic Church in Alexandria in order to spread the faith. A photo with Mitch and his two Habesha (Ethiopian) friends. 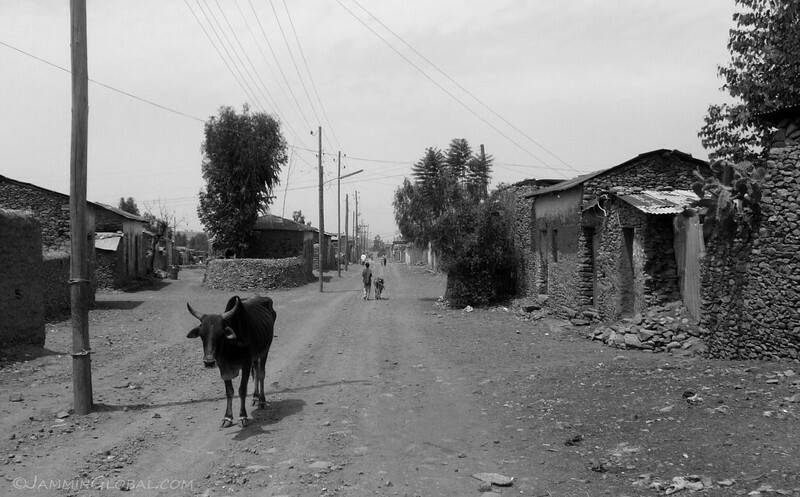 Mitch’s grandfather worked in the banking sector of Addis in the 1970s and was traveling around the country this summer to get to know the land that his recent ancestor lived in. He hitched a rough ride in a delivery truck from Gondar to Axum and was jealous of my transportation. A nice connection with Mitch is that his father works for a top team in Formula 1 and that’s the only sport that I follow, so I heard lots of inside stories during our hike. After days of eating Ethiopian vegetarian food, which is delicious, we splurged and got some grilled goat tips, which is had with some berbere spice mixed with oil. Mmm, mmm, good. In the afternoon we visited the prime historical site in Axum, the Northern Stelae Field; a site where many tall obelisks stand. Just like the pyramids of Egypt and Sudan, these stelae mark the location of the tombs of royalty and other important people of their time. 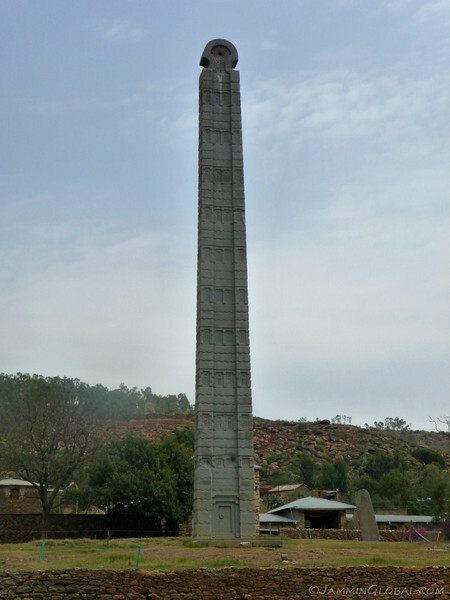 The stele on the left is called the Obelisk of Axum and it stands 24 m (78 ft) tall and the stele on the right, with the supports, is King Ezana’s Stele, at 21 m (70 ft). Axum is a seismically-active zone and most stelae have fallen, except King Ezana’s, which has been standing since it was built in 4 CE. That was also the last time that Axumities made obelisks, because the new Christian order forbade this pagan practice. 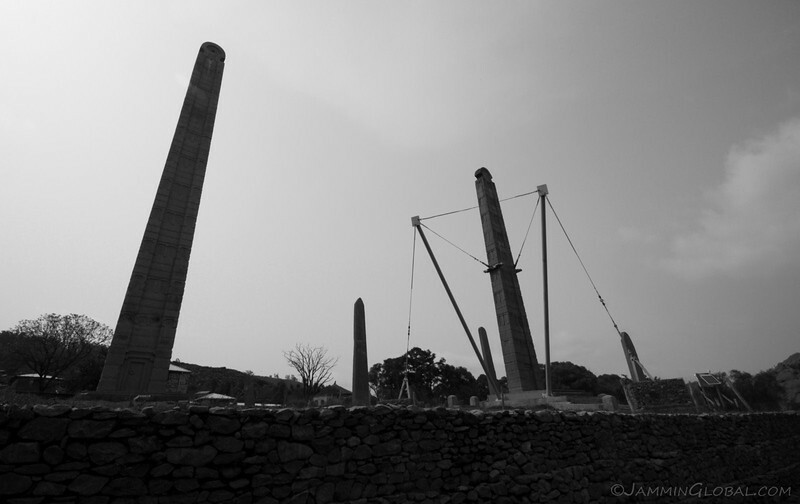 The Obelisk of Axum, thought to have fallen and broken a few years after it was made in 4 CE. 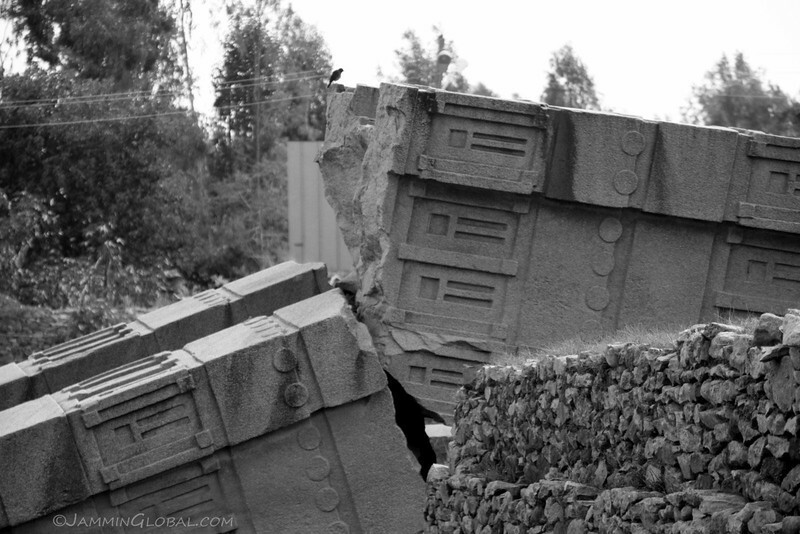 During the brief Italian occupation of Ethiopia (1936 – 1941), Mussolini ordered this broken stele to be brought back and erected in Rome, as a spoil of war and as a symbol of his new Italian Empire, which only lasted those five years. After much wrangling by Ethiopia’s rulers over the next few decades and with the UN pushing, Italy finally accepted to return this obelisk to the Ethiopians in 2003. But transporting such huge stones were an issue for the now land-locked Ethiopia and only after the runway at Axum was reinforced could an Antonov An-124 cargo plane land and return the stele in pieces. The obelisk was rebuilt and opened to the public in 2008 and at the same time, they reinforced King Ezana’s Stele. 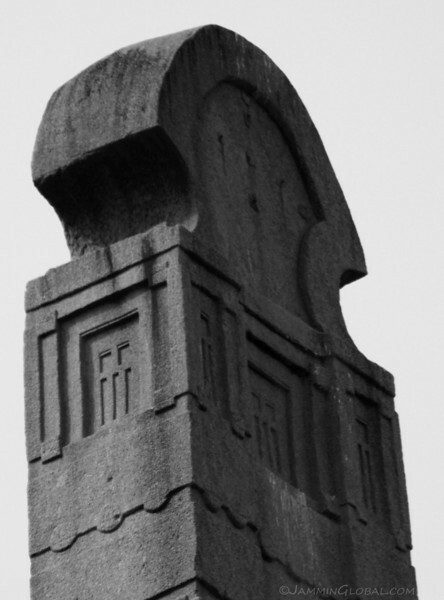 The Obelisk of Axum with its rounded-top that was originally covered in polished metal. Below the top are false windows in the granite obelisk for the royal spirits to look over their subjects. At the base of the obelisks in Axum are two false doors to symbolize the entrance to the underworld. The Northern Stelae Field of Axum with many broken stelae lying around, with the Great Stele in the center. The history of the site is interesting but the actual area was a bit disappointing as there are electric power lines running through the site along with the area looking quite disorganized. The Great Stele, lying broken on the ground, supposedly to have fallen during construction in the years around 4 CE. 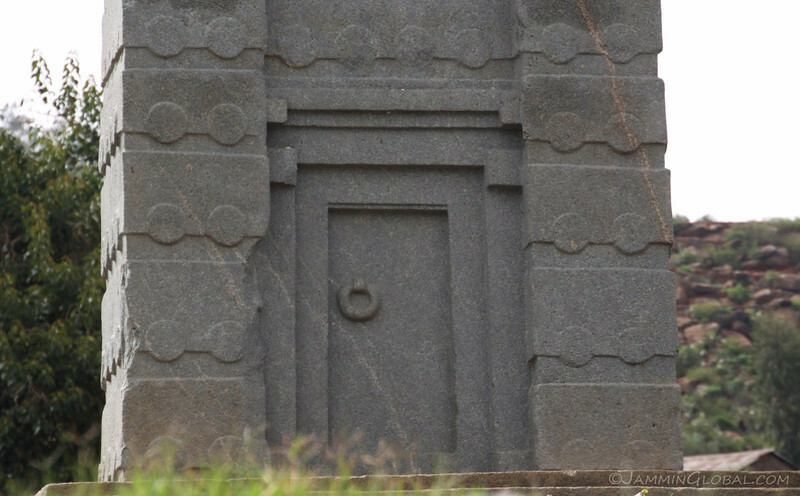 If it was standing, it would be the tallest stele at 33 m (108 ft). My guess is that the stele designers of Axum decided to make subsequent stelae shorter in height so that they would actually stand, like the other two royal stelae, sort of. 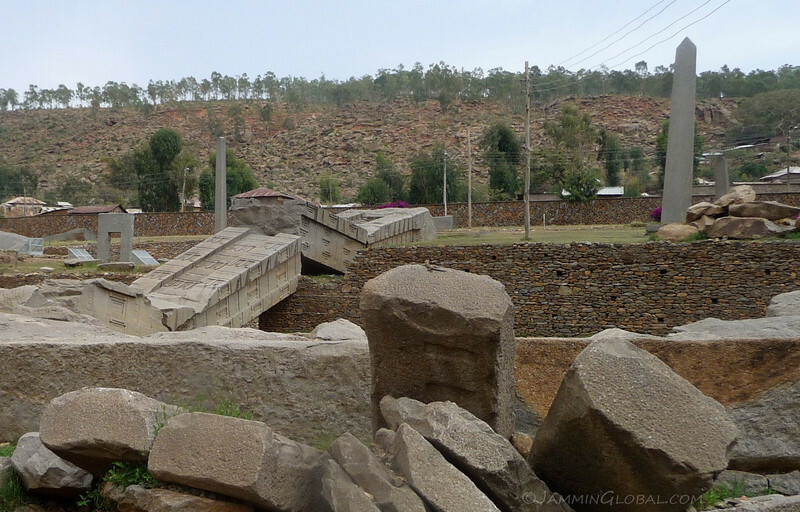 Nearby to the stelae field is this giant water reservoir, which Ethiopians believe is Queen of Sheba’s Bath. She is a prominent figure in Ethiopian history and from whom all Ethiopian emperors claimed direct descent, from the first, Menelik I in the 10th century BCE to the last, Haile Selaisse in 1974. Her importance is largely due to the Ethiopian story that she was tricked into sleeping with King Solomon during a visit and conceived Menelik I who was given the revered Ark of the Covenant to take to Ethiopia for safe-keeping. 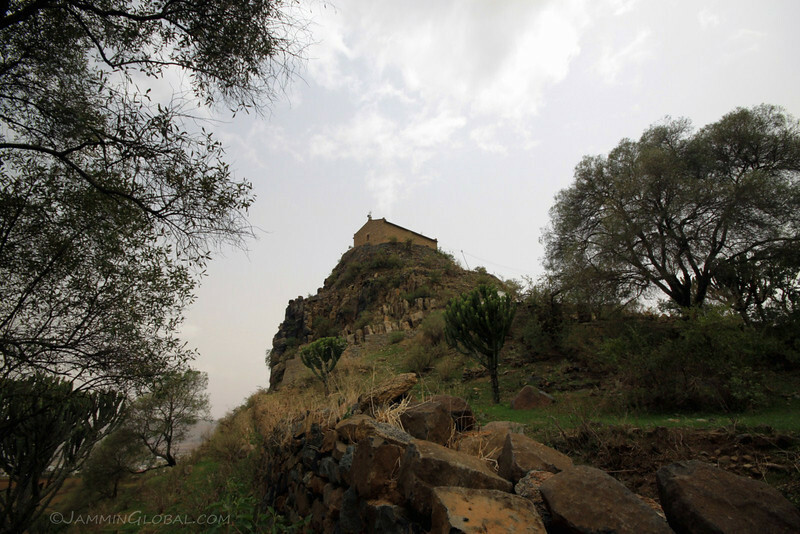 The ark is said to contain the original stone tablets of the Ten Commandments and to this day, the Ethiopian Orthodox Church claims that they sit in a special church in Axum, but nobody is allowed to see it. 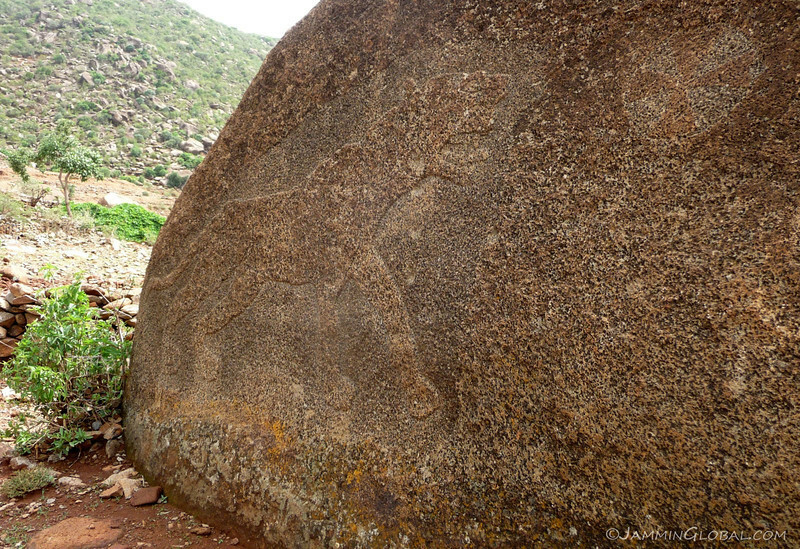 The Lioness of Gobedra, a large relief carved on this rock on the outskirts of Axum. Not much is known about its significance except a local story that says Archangel Michael was attacked by a lion here and he repelled the lion with such a strong force that it left an impression on this rock. Walking back into town on Italy Street, which is paved with cobble-stones, much like the rest of the city. 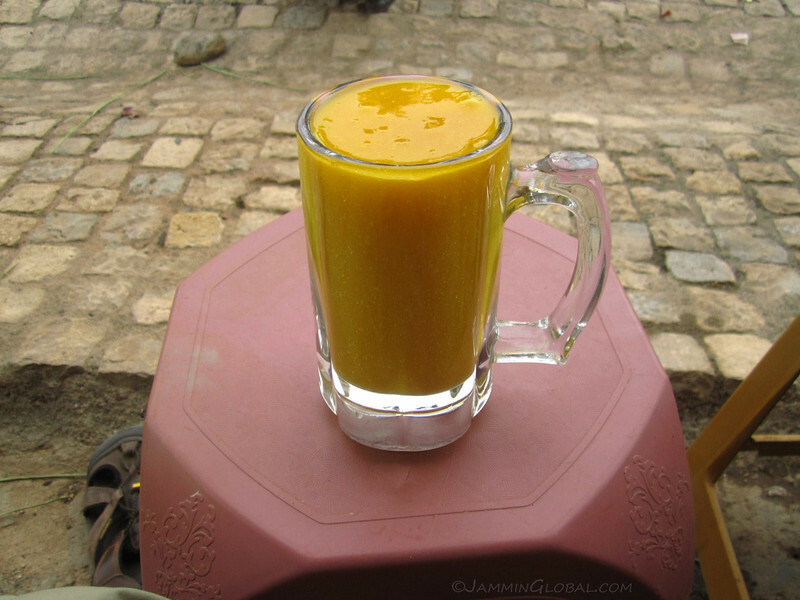 Getting a huge glass of fresh mango juice, which was delicious with a hint of lime. Two glasses, for Mitch and I, cost just 10 Birr ($0.60). 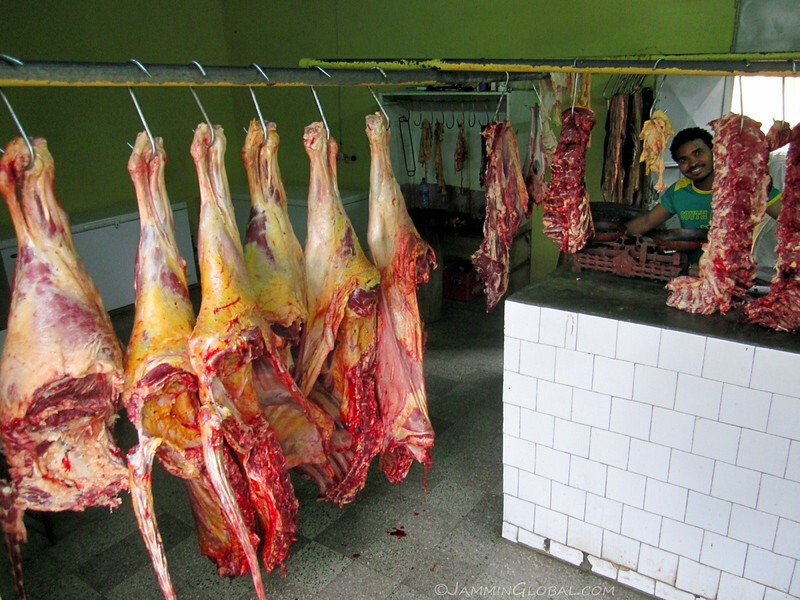 Passing by and taking a look at these beef carcasses hanging with their friendly butcher welcoming us in. 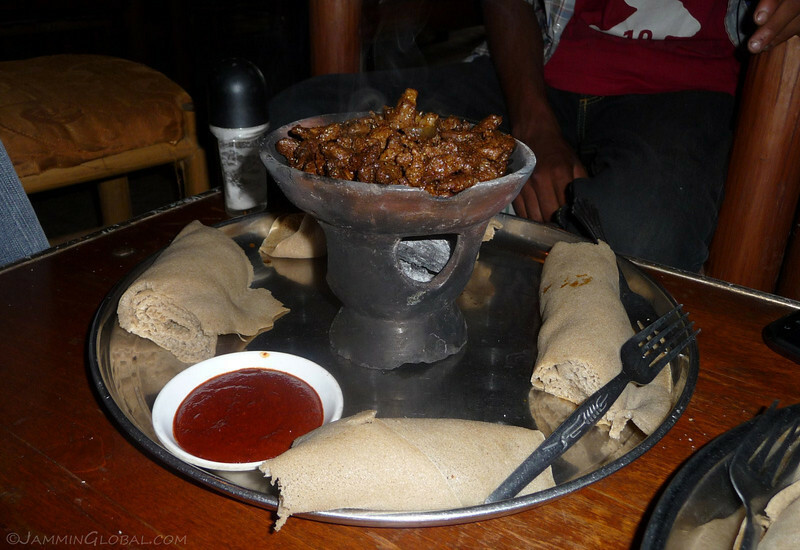 Most Ethiopians fast about half the year by not eating meat on those days, but they do love their meat. There is a special Ethiopian dish called kifto, which is minced raw beef mixed with mitmita, a spice mix, and niter kibbeh, a spiced clarified butter. 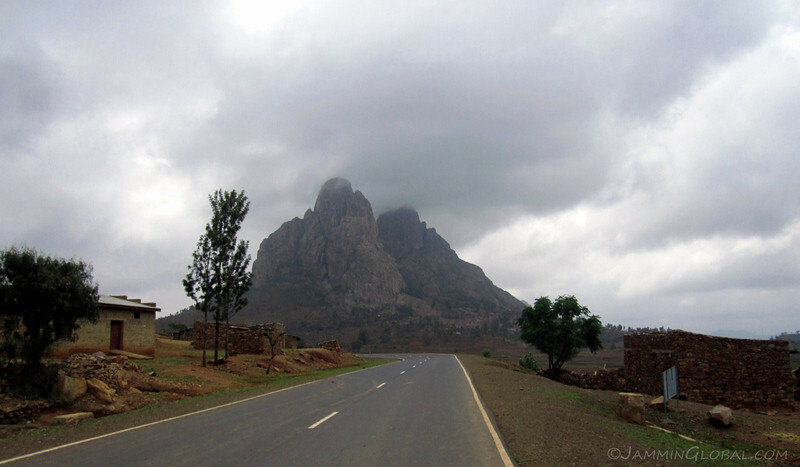 Back on the road, heading east from Axum to the junction town of Addigrat, where turning north leads to Eritrea and south to Addis Ababa. 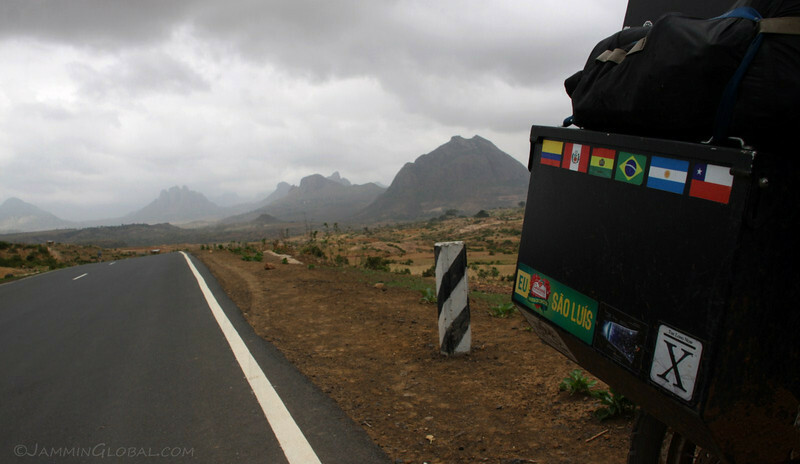 The road was in excellent condition and the scenery was epic, with numerous volcano-shaped mountains covering the landscape. 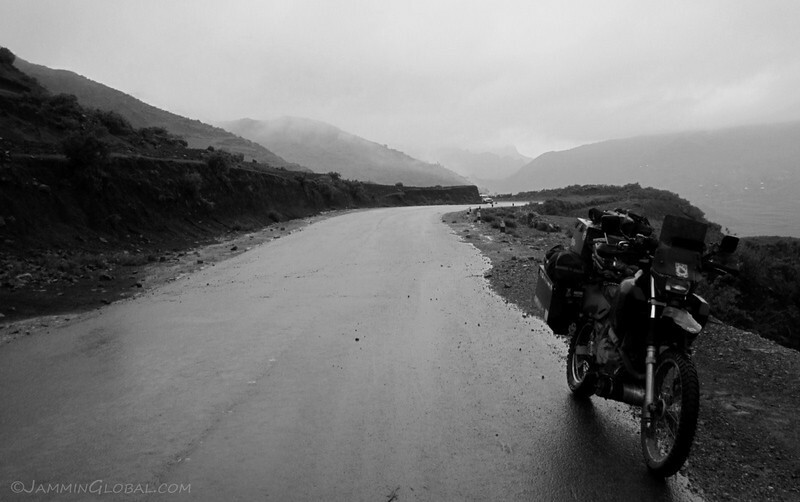 The overcast day added to the ominous feeling that I had, riding alone in this giant landscape. 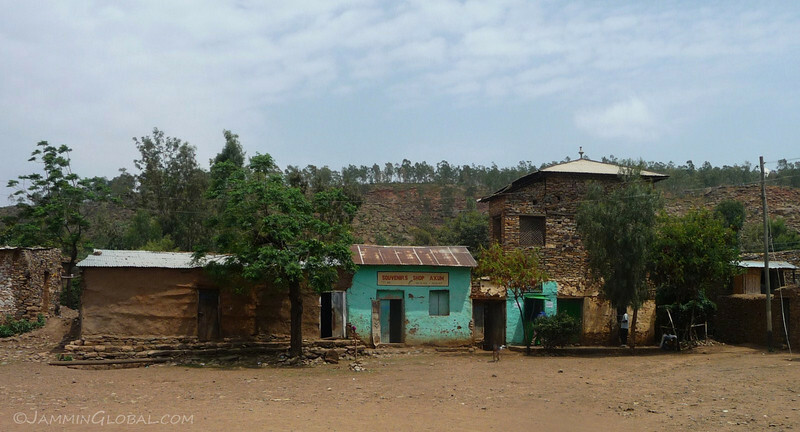 Just beyond those mountains lay Eritrea, a country that shares much of its cultural history with Ethiopia, but today, due to politics, these brothers consider each other enemies, much like the ongoing conflict between India and Pakistan. 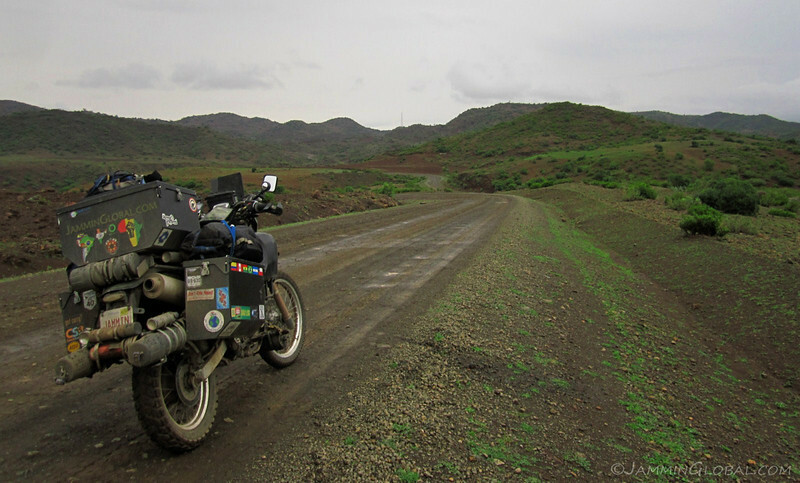 …but sanDRina is a good compromise bike in that she can ride well through mud and sand and still be a joy on twisty pavement, even while loaded down with all my worldly possessions. The DR650, a fine example of a dual-sport motorcycle. Yeah, I’m cutting the corner, but this is an open corner and there was really no traffic, almost. The mountains flowing their energy into sanDRina, who’s showing off her past travels in a distant continent. The big sticker on the bottom is from the city of Brazilian city of Sao Luis, where I spent three weeks, followed by a timeline map of the Universe from the Big Bang to the present and the X-bar sticker is from the Long Now Foundation, a group dedicated to raising awareness about long-term thinking, instead of our current short-term and end-times preoccupation. 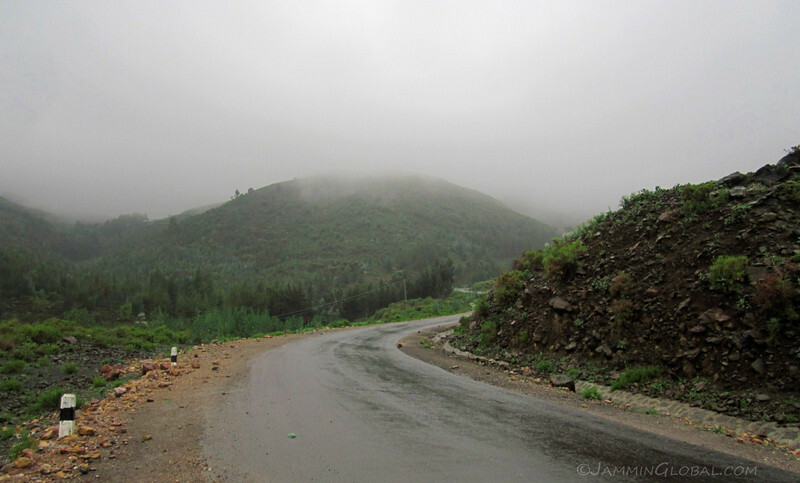 Climbing some serious grade as I crossed a mountain range that rose from the 2,100 m (7,050 ft) elevation around Axum up past 3,050 m (10,000 ft) before descending to Addigrat. I came flying around this corner and was greeted by a group of Ethiopian children, all running out to sell me some prickly pears, which were in season now. I really wanted to stop as I was hungry and enjoy this fruit, but there was no safe place to stop and I knew I would be mobbed if I did, so I kept on, knowing I would find it again. Like this, there were many times where people would run out onto the road pushing some fruit or vegetable for drivers to buy. The jet needle is supposed to be attached to the black slider, which is attached to my throttle cable and the jet needle goes in and out of a hole in the main jet, which determines how much fuel and consequently, air to allow into the engine to combust into power. 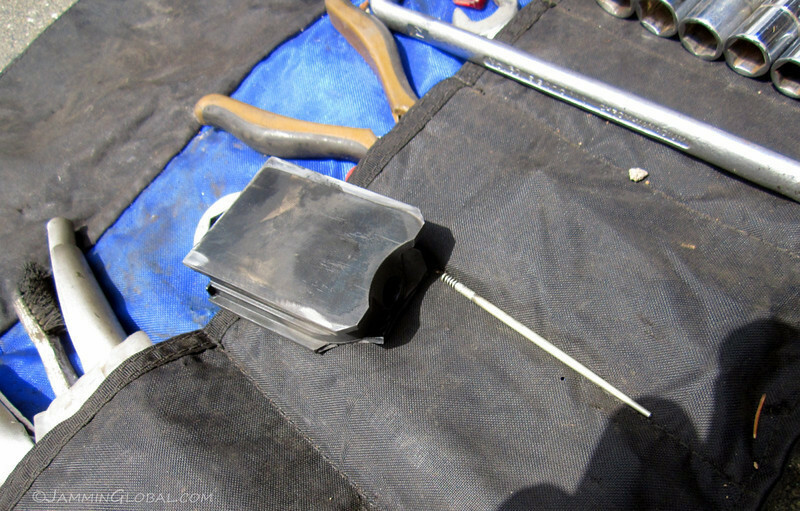 The jet needle is secured to the slider by a small cir-clip, which worked itself loose and dropped the jet needle into the main jet and starved the engine of fuel and air when the throttle was opened. 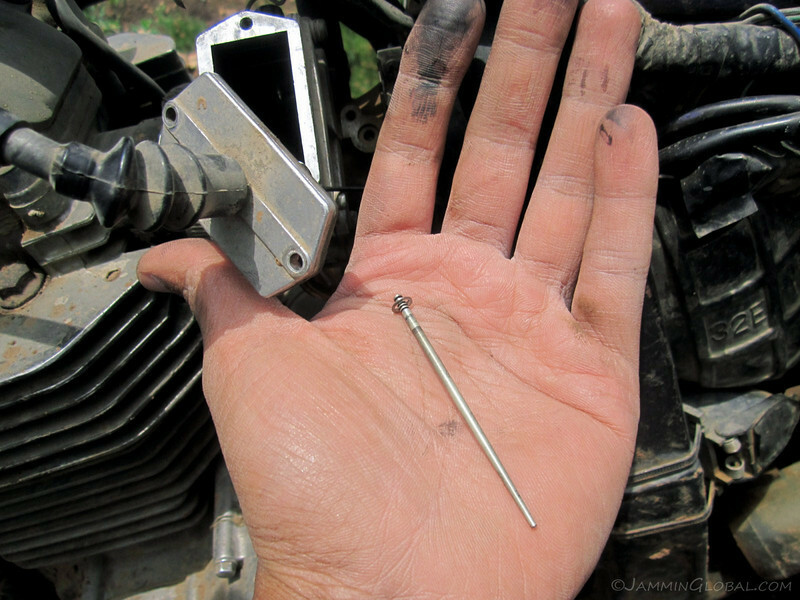 Followers of the journey will remember that I had an on-going issue with the jet needle during my time in Brazil, which was finally sorted when my sister and Gus, my mechanic friend in Chicago, shipped me a new jet needle. That was installed 26,018 kms (16,170 mi) ago in Buenos Aires and has been running fine since then until now, which is not bad for a mean time between failure (MTBF) of this system. I put the cir-clip back on the jet needle and reassembled everything and sanDRina was running fine again. 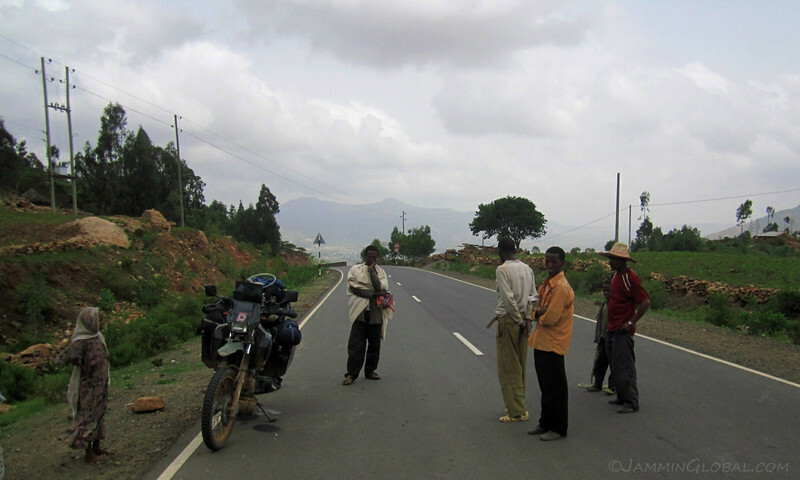 Of course, by this time, there was an audience to my road-side repairs of nearby villagers, who were very polite and just let me get on with diagnosing and fixing the issue. If there had been just kids around, I’m sure I would’ve been hassled a lot to give money, pens or sweets. There really was very little traffic on this road, evident by everyone just standing in the middle of the road. sanDRina was running great once again and I hoped the fix would hold as I was riding the technical mountainous pass before Addigrat, which was non-stop switch-backs on roads with no guard rails. To add to the technicality of the road, I had to anticipate trailer trucks cutting the corners, such as this guy around the upcoming switch-back. Climbing high and capturing the terrace farming of these mountainous people. At the summit of the pass, 3,057 m (10,027 ft), I encountered heavy fog, which at times reduced visibility to a few meters. But that soon cleared up as I descended down the other side to Addigrat, from where I turned right and started heading south once again. 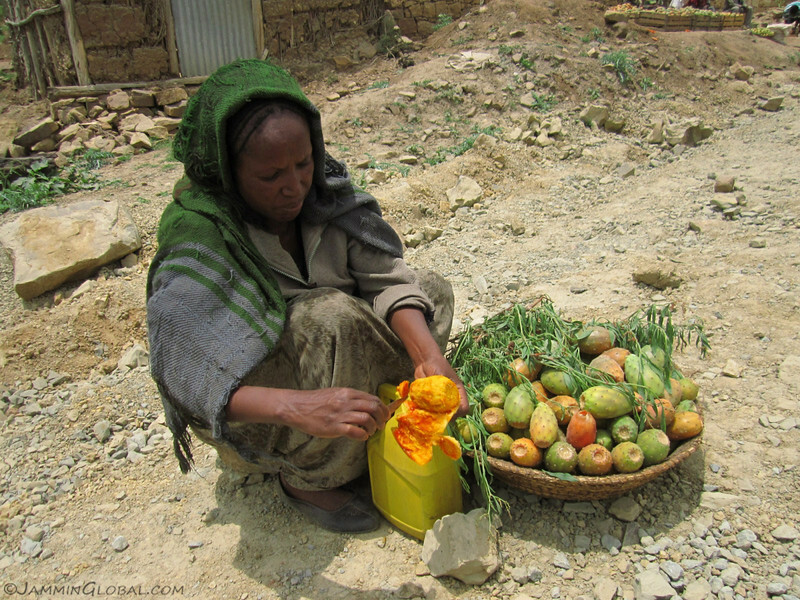 A little past Addigrat, I found a lone prickly pear seller by the roadside and stopped to enjoy a lunch of 10 of these delicious fruits. 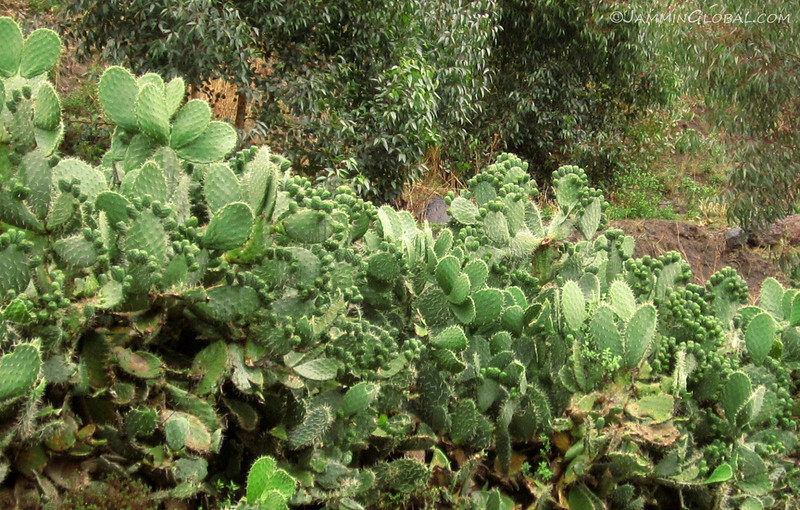 They’re also known as opuntia or cactus fruit, as they grow on the ends of cactus leaves. They have to be peeled carefully to avoid the small thorns, called glochids, that are very hard to remove once lodged in the skin. She would peel them and then I would pick the exposed fruit flesh and pop it in my mouth, where it just melted. It’s really sweet and I couldn’t get enough. They’re native to the Western Hemisphere and were introduced to Eritrea and Ethiopia during Italy’s brief East African sojourn. 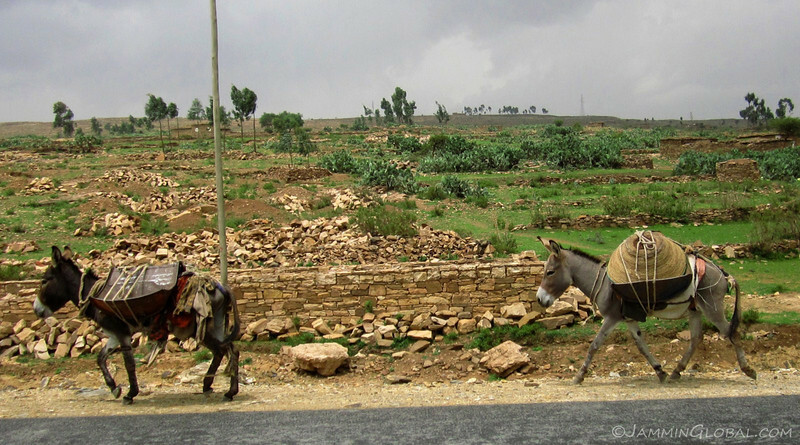 Riding into the afternoon and capturing these hardy donkeys as they trudged along on the road with their makeshift goods carrier, which was an oil drum, split in half and then bent to form across the spine. It threatened to rain just as I got near Mekele, but I made it to a hotel before the daily onslaught of falling water. 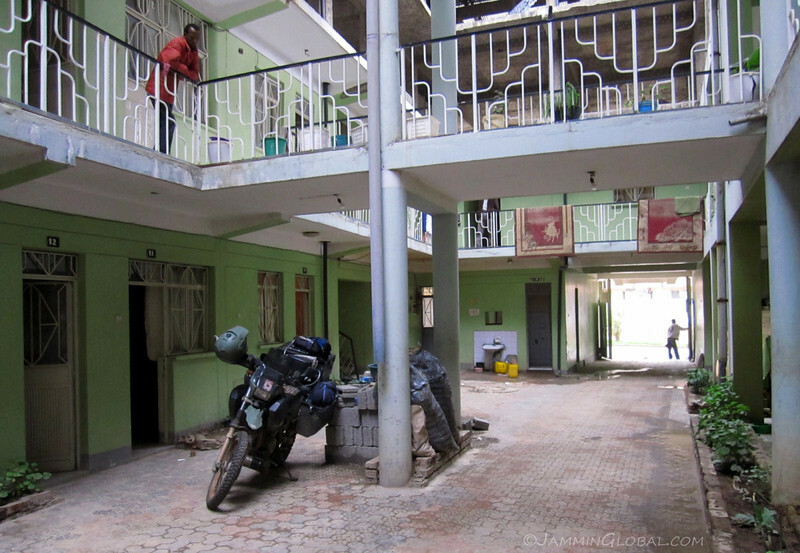 Stopping for the night in Mekele and enjoying secured parking at Dallas Hotel for 50 Birr ($3), near the bus station. By nightfall, the courtyard was filled with pickup trucks and vans from workers on the road and in the field. 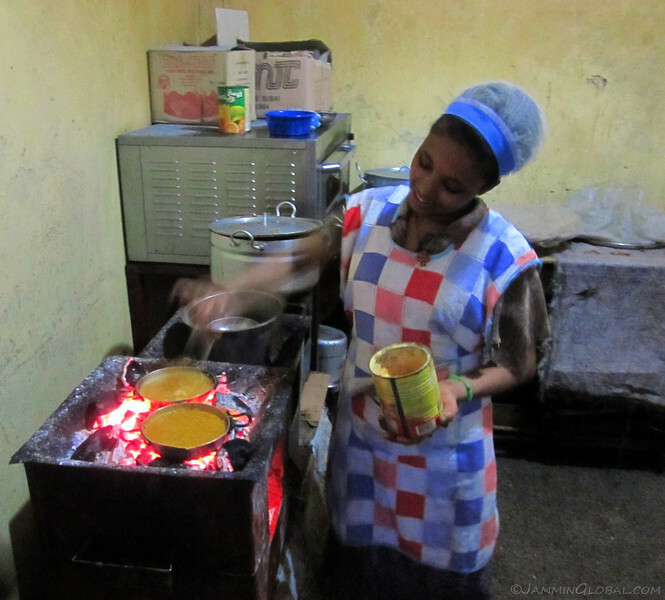 There wasn’t much to Mekele, so after a stroll through town and buying some dried fruit and nuts for the ride ahead, I ordered some dinner from the hotel’s restaurant. This lovely lady is preparing some tasty tagabino, made the proper way over a charcoal fire, for that added flavor. 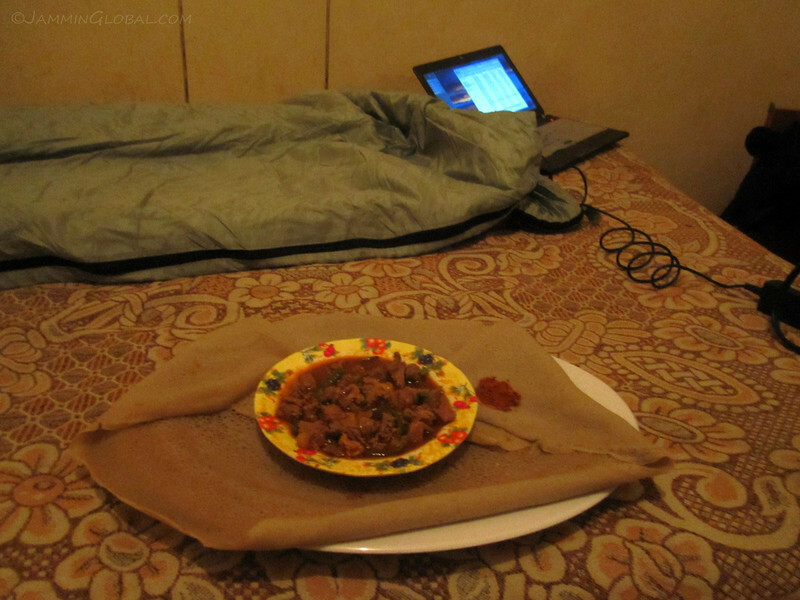 Enjoying a quiet night in with dinner in bed of injera with goat tips for 30 Birr ($1.80) and a Planet Earth episode on my laptop. I enjoy being social just as much as I enjoy being on my own. 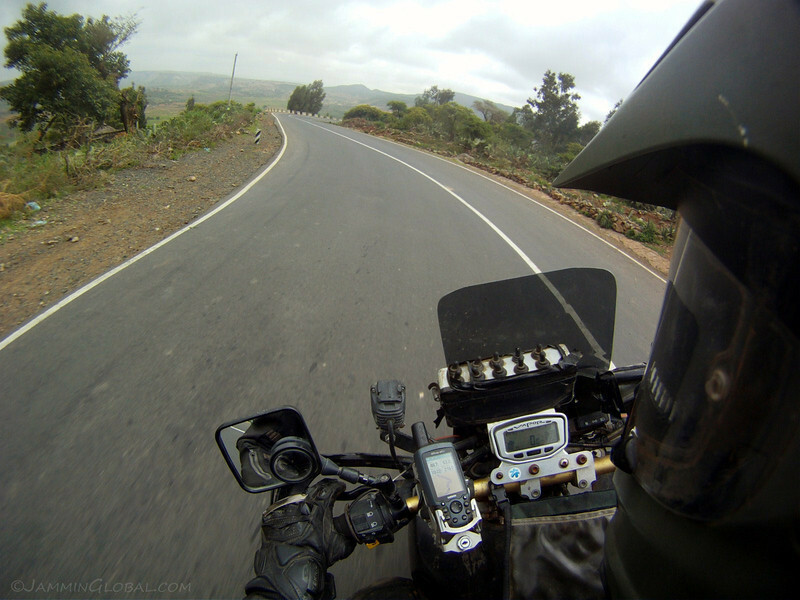 Waking up the next day to overcast skies and a constant drizzle as I headed towards Lalibela, 445 kms (277 mi) away. 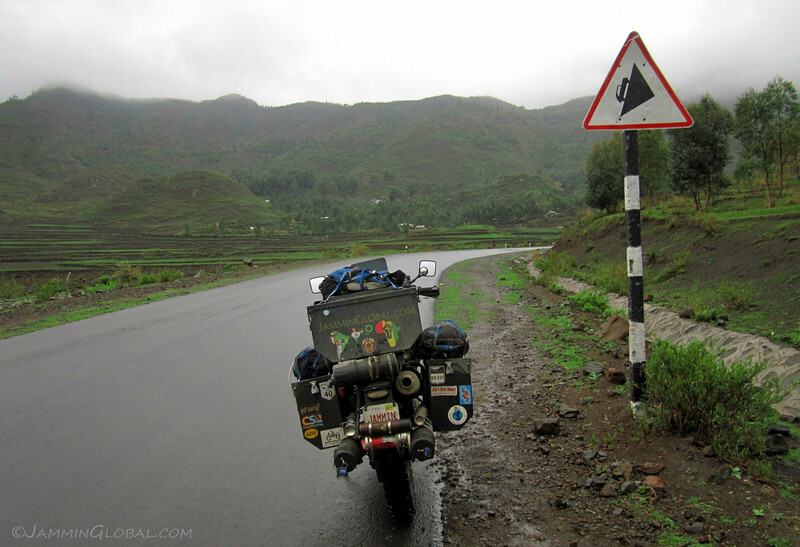 It was going to be a long day as those 400 plus kilometers were all on twisty mountainous roads, which were wet. The air was moist, increasing the humidity and making the reduced temperatures, due to the high altitude, even more pronounced. I was wearing my maximum number of layers, six, and felt comfortable as the temperatures dropped near freezing. My six layers for really cold riding are made up of a natural silk base layer against the skin, then a synthetic base layer, then thermals, then windproof liners, then the Kevlar mesh riding suit and on top of that rain pants and rain jacket. 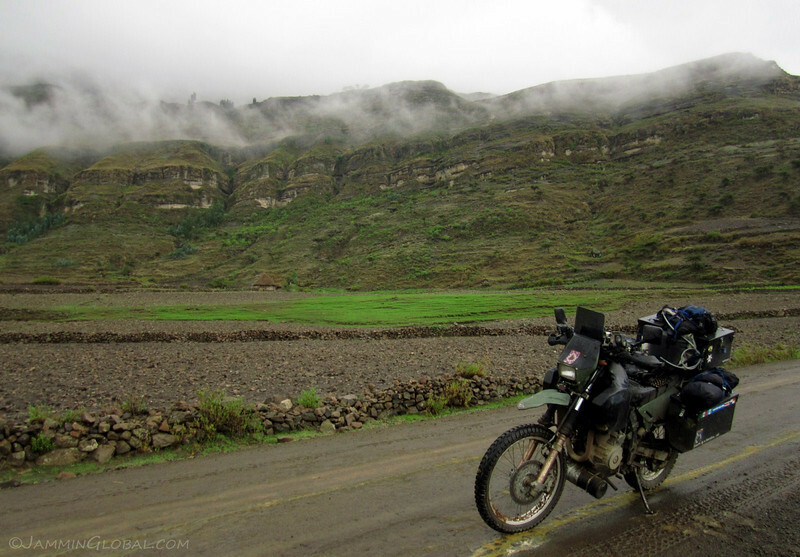 I don’t have heated gear, but this works fine for me and got me through chilly Patagonia and rain riding in Ethiopia. sanDRina looking clean and fresh after some rain riding on asphalt. Who needs a bike wash? All that mud got cleaned away. Cactus with blooming prickly pears. They now grow wild all along the roadside, allowing many rural people to pick the harvest and try and sell it while the season lasted. 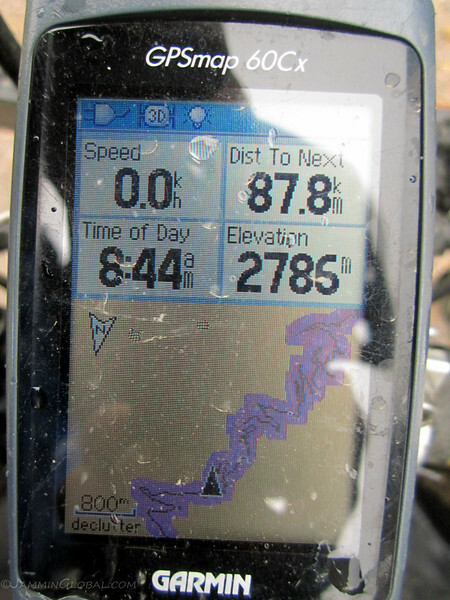 The roads were seriously ‘this’ steep. 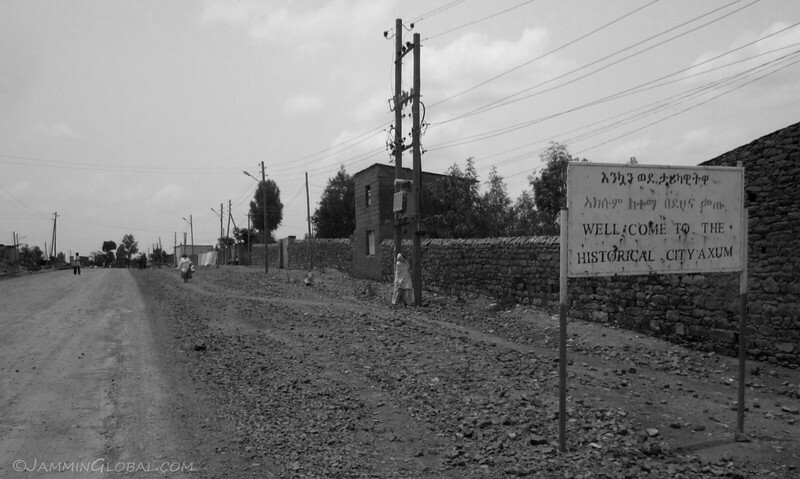 At the junction town of Woldia, I turned west to climb the eastern flank of the highlands as I headed towards Lalibela. 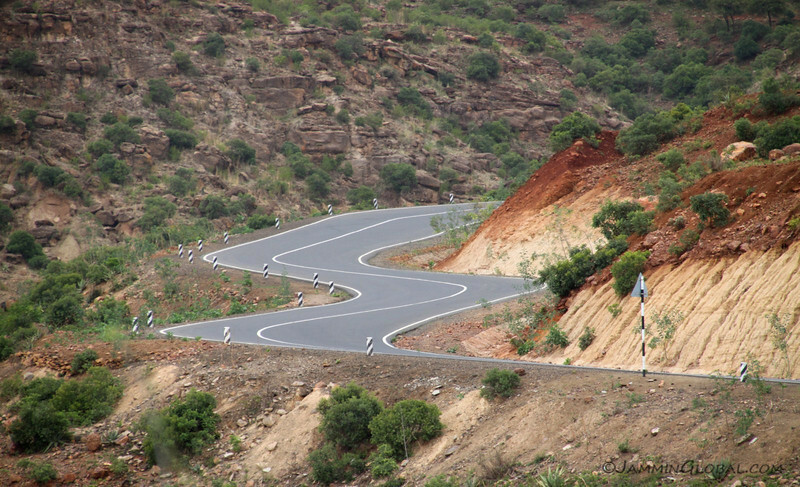 The road climbed and peaked at 3,548 m (11,640 ft) before dropping down to 1,900 m (6,234 ft) and finishing off in Lalibela at 2,400 m (7,874 ft). There are two roads that lead to Lalibela and I was told not to take the first one as it was very muddy with the recent rains, so I continued on the high plateau asphalt road that heads west to Bahir Dar and turned off at the second route, which was also dirt but a much improved road, with hard-packed mud. 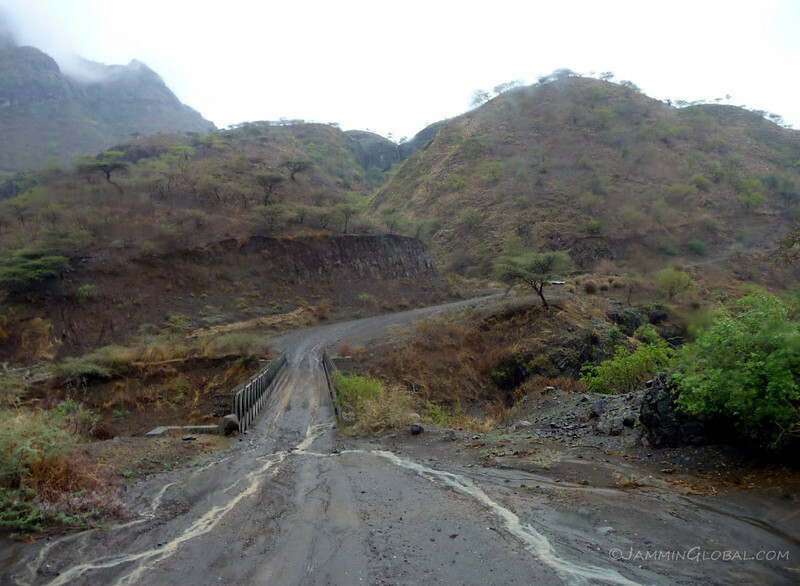 This dirt road descended sharply from the high plateau with lots of muddy switch-backs. It was a cold day and my rain gear was breached in places, leaving me feeling wet, but all that was worth it for the moment the rain stopped and the lush landscape breathed out its low-hanging clouds into the clear air. 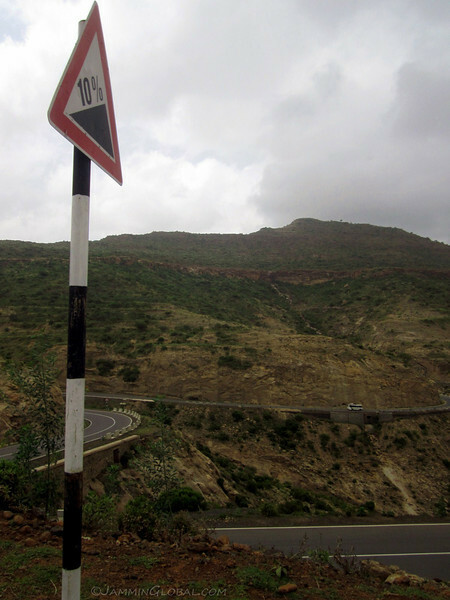 A panorama stitch of the road to Lalibela as it descended down these lush, terraced mountainsides. 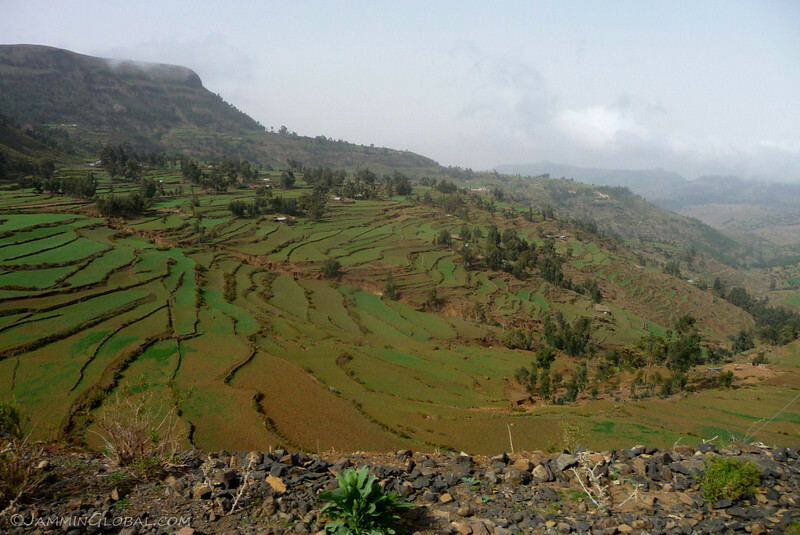 Farmers growing teff on the mountainsides of the Ethiopian Highlands. 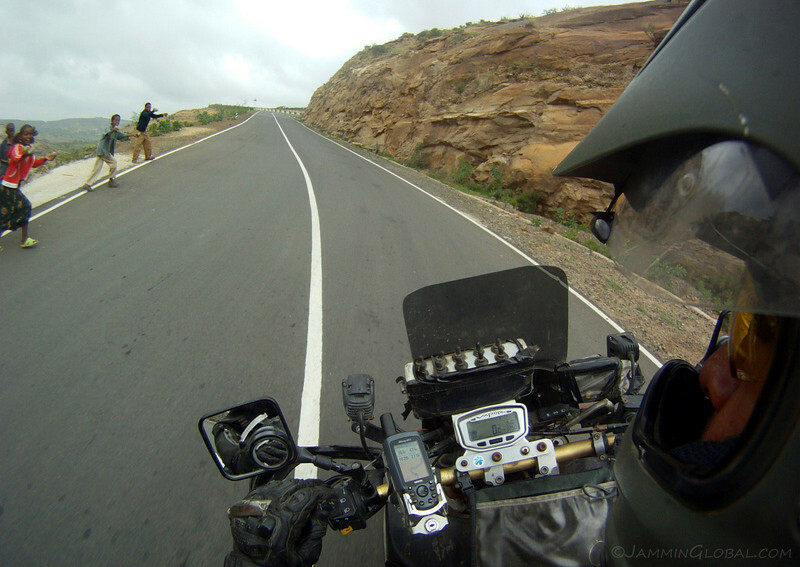 Riding the last stretch into the architectural wonders of Lalibela. 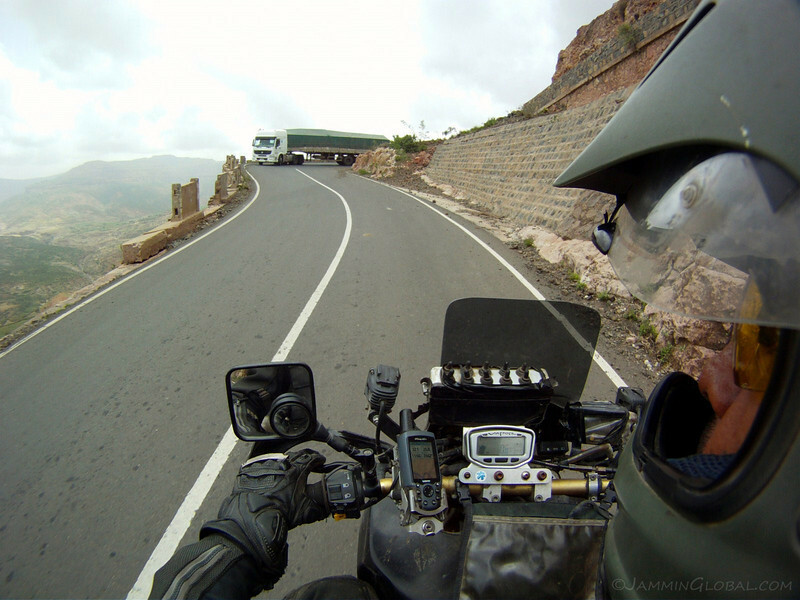 I moved from one historical wonder of Ethiopia, Axum, to another, Lalibela and the interesting part of traveling with a motorcycle is seeing and enjoying all that’s in-between the sightseeing. With the mountainous landscape of Ethiopia, the in-between stuff is actually more awe-inspiring to me than the historical monuments, at times. 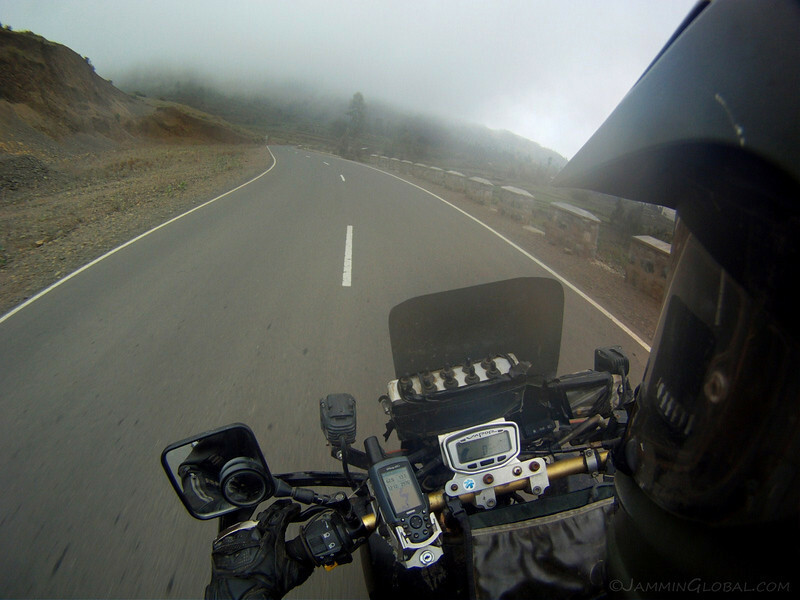 It was the rainy season, so I couldn’t fully enjoy all the curves and endless twisties but that only gives me another reason to come back and enjoy the riding paradise that Ethiopia is.